When Google has enough information about your business, it can correctly display your business in online listings. That’s why it is important to complete your listing accurately by verifying your business contact details and website, include business hours, and ensure there is no duplicate information. Set up your Google business page, if you do not have. You can do that by clicking here. Enter the business name, country, street address, city, Pincode, State, Phone number and category properly. Choose whether you deliver any goods/services at their location. Include telephone numbers, address and website to allow Google to provide as details as possible. 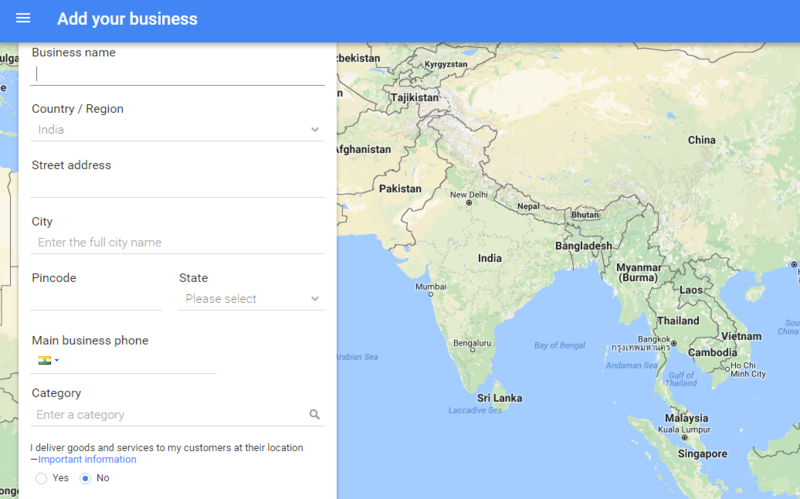 Also remember to include your business operation hours, since Google Maps tells users when a business is open or closed. Any duplicate information will be discredited by Google. Google will then ask you to Verify your business. You can do that, my confirming your address, after which they will send you a code through post, at the physical address you have entered. This will take 7-15 business days, make take some more days depending upon your location. Once you get the code, you have to go to the Google Business page and verify your listing by entering the code. After it is verified, it will start showing up in Google. User reviews whether good or bad add an aspect of trustworthiness to a business. 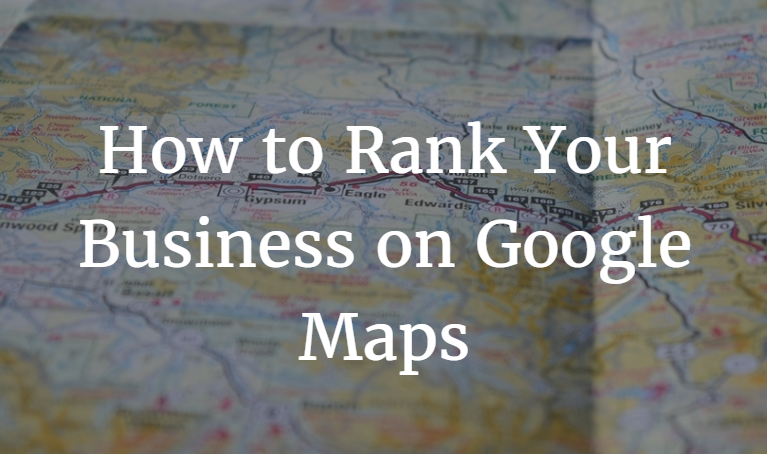 Google ranks business using the number of reviews, so if your business has a good number of positive reviews then you are likely to rank high on Google Maps. However, when your business has been opened for user reviews, you cannot reverse that. But that doesn’t mean all is lost, if your services and products are truly atrocious, the negative reviews rarely appear in between. To get started, go to Google Map listing, click on ‘more information’ then copy the direct link that you find there. This link can be shared on social media to call for reviews. If you like, you can create a landing page that directs the user to your Google Maps listing review form. Just a couple positive reviews are enough to raise your rankings instantly, so you may decide to ask some of your trusted and loyal clients to write reviews for you. 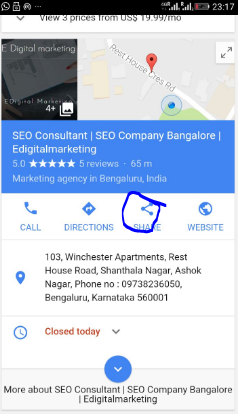 If you search for SEO Consultant Bangalore, you will find, Edigitalmarketing.in ranking on 1st page in the Map section. We applied the same techniques as we have described in this post. When creating Google Maps listing for the first time, there are options of adding primary industry category, or a chosen keyword that describes your business. What’s more, business owners can add up to five extra categories. Use all the five slots, but the primary category is used to classify your business with the extras acting as additional descriptors. There is always a character limit for every Google Map listing, but you may include local SEO keywords describing your business instead of using a surplus description. For instance, write “SEO Company Bangalore” instead of “good company offering SEO services in Bangalore”. At least, be creative, precise and direct. Adding a photo to your Google My Business listing makes your business stand out among the rest. Come up with a nice photo of the business and is also on the website. You have the option of adding more photos, so ensure you pick the ones that customers will like. If you don’t add a photo to your listing, your business will only show a generic map.